Long ago, there lived a crow in a jungle. Once he was wandering in search of water to quench his thirst. At last, he came flying over a village. There he saw a pitcher lying in front of a house. There was some water in it. The crow tried to reach the water, but couldn't succeed. The water level was too low in the pitcher. The crow began to think of some practicable device and finally came up with a bright idea. He looked around and found a pebble. He picked up the pebble in his beak and dropped it into the pitcher. The crow realised that the water level had risen a little. So he dropped more pebbles in the pitcher till the water level was high enough for his beak to touch it. 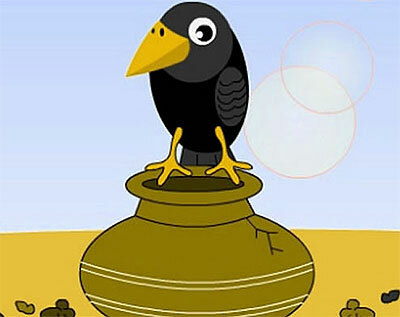 The thirsty crow then drank the water to his hearts content and flew away.